Texas Online Radio: "Cowboys and Aliens" ~ Review - Two thumbs down. 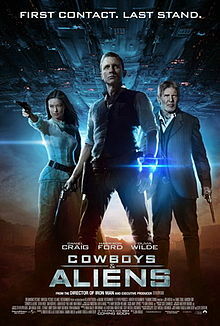 "Cowboys and Aliens" ~ Review - Two thumbs down. After much anticipation over the last several months with exciting trailers and hype, "Cowboys and Aliens" disappointed as far as I am concerned. The movie story line was slow to start, and seemed "thrown" together. It just didn't flow like a Ron Howard/Steven Spielberg coached film should. There were a few special effects that dated back to the "Star Wars" days, and the aliens looked like any mindless, run of the mill monsters seen in any video game. The location scenery was the best part of the movie, wide open panoramas of open country seen in the old time westerns. The cast seemed to do their best with the roles they were given, but it just didn't come together for me. It was choppy, predictible, and seemed to rush to a close... leaving you after 181 minutes saying "Huh??" In my opinion, save your money... rent it down the road sometime if you're interested. Get your Texas Online Radio tee shirts and gear here!